Tagline: "This is Willard and his friend Ben. Ben will do anything for Willard"
Willard Stiles (Bruce Davison) is a shy, withdrawn 27-year-old who lives with his bossy mother Henrietta (Elsa Lanchester) in a house that’s in constant need of repair. At work, Willard’s boss, Al Martin (Ernest Borgnine), mistreats him, giving him a multitude of tasks and paying him very little. In fact, Martin would probably fire Willard if he could (Willard’s late father started the company years earlier, and Martin keeps the young man on as a favor to the aging Henrietta). Willard even lacks the self-confidence to ask his pretty (not to mention more than willing) co-worker Joan (Sondra Locke) out on a date. Yet, despite all this misfortune, Willard does manage to make some new friends: the rats that have invaded a portion of his back yard! Ignoring his mother’s orders to kill these unwanted vermin, Willard instead feeds them, and trains a few to follow simple instructions. At first, he has only a handful of rodent pals, giving them names like Queenie, Socrates, and Ben. It isn't long, though, before Willard has lured in hundreds of rats, all eager to do his bidding. With an army like this at his command, Willard’s confidence grows, spelling doom for those who treated him badly over the years. But is Willard actually the one in control, or do his little pals control him? 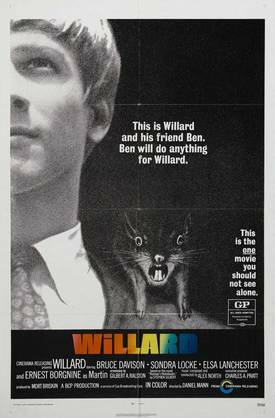 Directed by Daniel Mann, 1971’s Willard isn’t the movie to watch if you have a fear of rats (which I do). Willard grows very close to his new friends, and even brings Socrates and Ben to work with him on a few occasions (letting them hide in the stock room until quitting time). At home, the rats have the run of the entire basement, while Socrates (and sometimes Ben) sleeps in the upstairs bedroom. Willard doesn’t think twice about picking up a rat, or planting little kisses on them. And if the thought of a rodent hiding in your pants pocket gives you the willies, then Willard will be a hard movie for you to sit through (things get especially difficult late in the film, when Willard’s furry compadres go on the offensive). Yet even more impressive than the well-trained rats that follow the lead character wherever he goes is the performance of Bruce Davison as Willard, who, over the course of the movie, goes from a loser to a self-assured killer before our very eyes (“You made me hate myself” Willard says to Mr. Martin. “Well, I like myself now”). Davison does a wonderful job conveying his character’s early weaknesses as well as his eventual confidence, at which point he fights back (sometimes violently) against those he feels are trying to manipulate him. In most movies, a transformation such as the one Willard experiences would give the audience something to cheer about, and, to be fair, we do cheer for Willard most of the time. Alas, he takes things too far, further than he ever intended, and even though it’s the rats that do his dirty work, Willard himself becomes the real monster of this film. I really enjoyed the remake with Crispin in the lead. I guess I need to see this one. This one is on my Bucket list to track down and watch. Bought this recently during Scream Factory 's Anniversary sale, and need to watch it! I watched it as a kid and loved it, mostly because I identified with Willard.